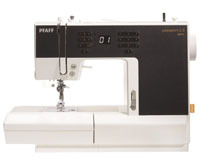 A wide range of high quality sewing machines to meet all your needs. Whether you are a beginner or looking to upgrade we have the solution. Looking for a new sewing machine but not sure what you want - We can't begin to tell you all the features and benefits here - so come and talk to us. IDT (TM)- Makes the difference and is only from Pfaff! Ever been frustrated because you struggle to estimate a 1/4" seam when using the walking foot or would like to do embroidery stitches when quilting - well now you can. The IDT means you don't need a seperate walking foot so you can use the 1/4" seam guide foot or embroidery feet and be as creative as you want. The idt doesn't just help when quilting however because the fabric is fed from both top and bottom simultaneously with any stitch, no matter what length or width there is absolutely no fabric slippage.